When numbers of English women began arriving in the nascent Jamestown colony, there were significant impacts that extended beyond those experienced within the predominantly male settlement. The colony’s fragile relationship with the Powhatan Indian society that surrounded it was also profoundly affected. 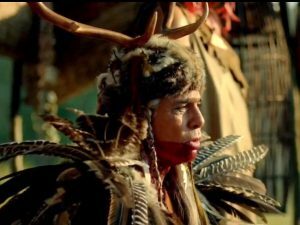 The third episode of the television series “Jamestown” addresses this issue during an exchange between the Powhatan chief Opecancanough and Governor Yeardley. The chief’s observation that there are many women in the English town is verified by Yeardley who adds that many more will come. The implications of this admission are not lost on Opecancanough who knows that families mean children and many English “bloodlines” will be established in his land of Tsenacommacah. The Jamestown settlement will continue to grow, encompassing territory traditionally used for native sustenance. There will be less need for reciprocity. “What kind of friends are we?” asks Opecancanough. In episode 3 of “Jamestown,” Alice Kett grinds corn in a pot quern, a type of rotary hand mill. Archaeological evidence has suggested that in the first two years of the English settlement—when young Anne Burras Laydon was the only English woman present—there were Powhatan women visiting, and perhaps even living, in and around James Fort. Scores of artifacts made and used by these women including clay cooking pots, stone food processing tools, bone matting needles, and shell beads were found by archaeologists at Historic Jamestowne in fort contexts relating to the 1610 clean-up and rebuilding efforts instituted by Lord De La Warr. Objects made and used by early 17th-century Powhatan women also will be part of the special exhibition opening at Jamestown Settlement in November 2018, “TENACITY: Women in Jamestown and Early Virginia,” enriching the stories of these first Virginia women. attempt to create alliances and incorporate the English settlement into his chiefdom. certain Rule, that the English were not their Friends, if they refused it.” But by the summer of 1609, Indian women and the materials of their making disappeared from the fort as families of the colony’s gentlemen began arriving. Powhatan women were no longer needed by the English and could no longer form alliances useful to the Powhatan chief. The permanency of the settlement became even more visible with waves of women arriving as a result of the formal Virginia Company 1619 recruitment of wives for the male planters. This was the beginning of the English bloodlines that would soon take over Opecancanough’s land. The complex relationship between the Powhatan and the English was destined to change as the reasons for interdependence dissipated.